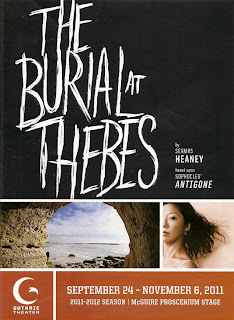 The Burial at Thebes is a typical Greek tragedy - someone defies the will of the gods and their life falls apart as everyone they love dies. But what's not so typical is the musical accompaniment that adds to the story. This is a Greek chorus that actually sings! Combined with powerful performances by the entire cast, it's a wonderful and jam-packed 90 minutes of theater. 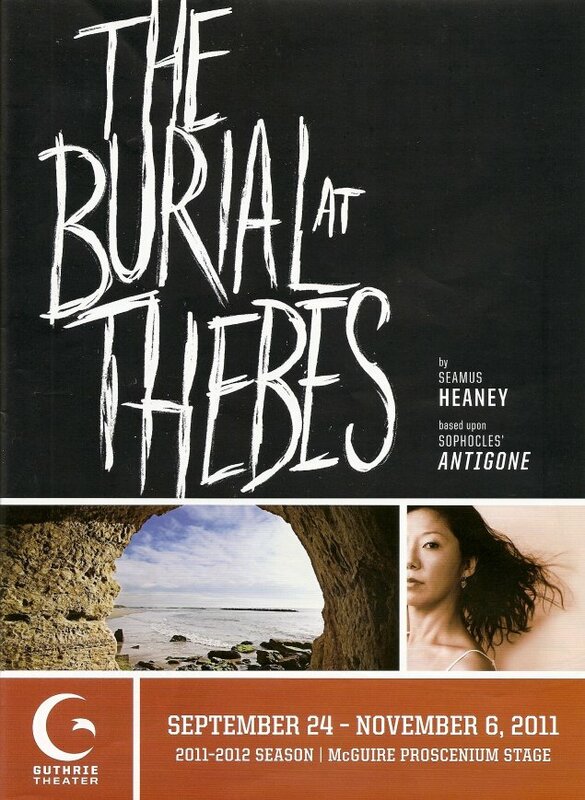 The Burial at Thebes is a translation of Sophocles' Antigone by Irish poet Seamus Haeney. In Greek mythology, Antigone is a daughter of Oedipus (you remember him - the one who killed his father and married his mother). So it's fair to say her life was doomed from the start. When her brother is killed as an enemy of the state, King Creon (her uncle) declares that his body cannot be buried in the traditional way. Feeling that she must obey the laws of the underworld rather than the laws of the mortal world, Antigone defies the King and attempts to give her brother a proper burial, knowing that it means her own death. Creon will not back down and insists that she be put to death. He realizes too late that he chose wrong, and is unable to prevent the tragic events that befall everyone he loves. This is a large and talented cast in a show with a relatively short running time, which means the audience is treated to little gems of performances throughout the play, from Brian Sostek's comic relief as the guard who delivers the news to Creon that someone has broken his decree, to Greta Oglesby as the prophet with creepy unseeing eyes and a powerful voice, to Sun Mee Chomet as the doomed heroine, to Regina Marie Williams' brief appearance as the grief-stricken mother Eurydice. And through it all Stephen Yoakam gives a powerful leading performance as Creon, transforming from a strong, confident, unyielding ruler to a grieving and remorseful father and husband. On top of the great acting performances, or rather intermeshed with them, is some amazing music (composed by J.D. Steele of the fabulous Steele family, with piano accompaniment by his brother Billy and percussion by Marc Anderson). The incomparable Robert Robinson leads the Greek chorus that sings and speaks with equal melodious beauty. Every time Robert opens his mouth it's a "lift up your hands" kind of moment; add to that the beautiful harmonies created by Lee Mark Nelson, Richard Ooms, T. Mychael Rambo, and Joe Nathan Thomas, and you have some powerful music that really heightens the emotion of the play. An imposing set of towering walls and flowing dramatic costumes add to the overall effect. What more can I say, it was another amazing evening of theater, music, emotion, and drama at the Guthrie Theater.